Another handy thing to have when you're fly fishing is a bottle of dry-fly floatant. If you've never fly fished before, this may be a bit mystifying. By the very nature of fly fishing, the angler must cast his fly repeatedly into the water, tempting the fish to bite. Dry flies, after a few casts, will absorb enough water to sink, losing their effectiveness. Dry-fly floatant is available in several forms. It is applied to your dry flies to keep them from absorbing water and to help them float like the flies they are supposed to represent. You can usually get a good deal on floatant for $10 or less. Most are much less, so you may want to try a few types and find out which one is your favorite. Refills are available for some versions, and some come with a re-usable bottle that you can put a wet fly in with some desiccant crystals to dry it off. The bottles can also be used to apply powdered floating assist substances. Just shake a little bit of the material into the bottle and add the fly. Shake well. Voila! A fly that is all coated and ready to float! A traditional type of floatant is made of mucilin paste. This is thick and waxy, but it turns to liquid at body temperature, so when you touch it, it liquefies enough to apply to your line or fly. It is a little more challenging to use than many of the new silicone floating substances, but it is safe for all non-self lubricating lines. Another type is a thick silicone gel. There are several of these on the market to choose from. Use it sparingly on flies made with coarse hair. It must dry first before using the fly. Another gel type is applied with your finger onto the hackles, tail or wings of your fly. Don't use too much, as it can darken some of the colors on your fly if coated too heavily. Many of these are temperature sensitive, so they will liquefy at body temperature for easy application. If you prefer a temperature-stable dressing, you'll be able to find a few like that as well. Some of these floatants should be applied at least a day before you go fishing to to give them time to dry sufficiently. These long lasting varieties can be rubbed onto the fly making materials before you even tie your fly. 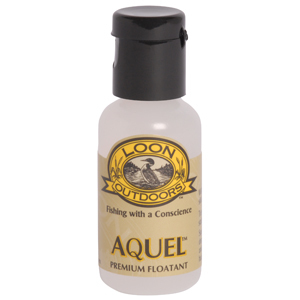 This type tends to be odorless when dry and should not affect the color or softness of your flies. Other varieties of silicon gels will contain pheromones, to help mask the odor of humans on the flies and line. Some will also dry quickly, either shortly before fishing or even during a cast. This variety is careful not to leave any oil on the surface of the water, which may tend to spook wary fish. Still other versions of this product will create realistic air bubbles on your flies, like they really were an insect that just dipped into the water. Powdered silicon dressings can be used in small shaker bottles like described above. They may or may not be mixed with desiccants to absorb water off of waterlogged flies. With some of them, simply squeezing the wet fly between a tissue or piece of cloth is enough to remove the water. 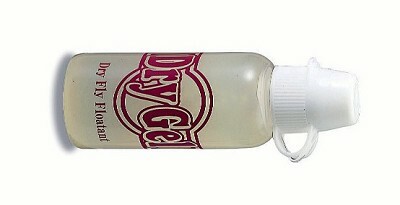 There are also silicon sprays you can apply directly onto your flies with a single pump of the bottle. You can even combine different dressings. Say you apply a gel to your flies the day before you go fishing, and as they are used during the day and get a bit waterlogged, you can dip them in the shaker bottle and reapply a little powdered dressing as the day progresses, allowing you to use your flies all day long with little trouble.